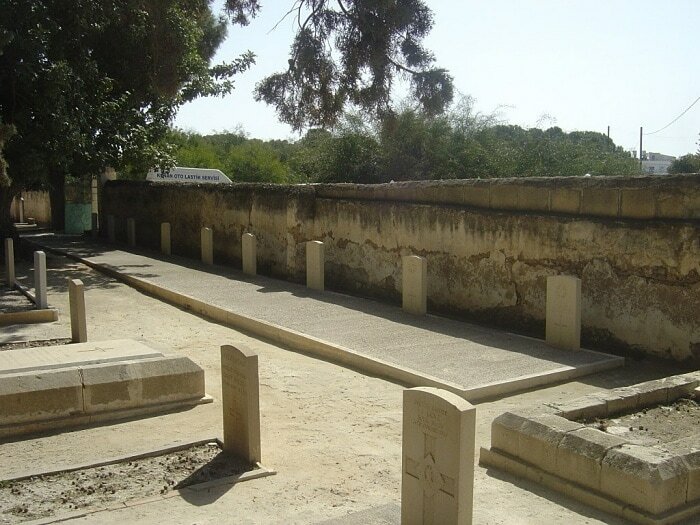 Famagusta Military Cemetery is located 65 miles from Nicosia. Approaching from the Nicosia/Famagusta dual carriageway, turn right at the roundabout signposted to the town, and then right again at the large roundabout surrounding a war memorial, signposted to Larnaca. After approximately 300 metres take the left fork, also signposted to Larnaca, and the cemetery will be found on the left hand side, about 100 metres further on. Cyprus is an island in the North-Eastern corner of the Mediterranean Sea. Until the 5th November, 1914, it belonged to Turkey and was administered by the United Kingdom; on that date, in consequence of the declaration of War on Turkey, it was annexed. It was garrisoned throughout the War by British troops; and during part of 1915 a British Convalescent Camp was placed on the island.